284.—The Harp, Accompanied by Other Instruments (cotton MS.). The picture history of the manners and customs of a remote period is perhaps more interesting and instructive, is certainly more to be relied on, than any written description. It is difficult for a writer not to present the forms and hues of passing things as they are seen through the glass of his own imagination. But the draftsman, especially in a rude stage of art, is in a great degree a faithful copyist of what he sees before him. The paintings and sculptures of Egypt furnish the best commentary upon many portions of the Scripture record. The coloured walls of the ruined houses of Pompeii exhibit the domestic life of the Roman people with much greater distinctness than the incidental notices of their poets and historians. This is especially the case as regards the illuminations which embellish many Anglo-Saxon manuscripts. Some of these were not intended by the draftsmen of those days to convey any notion of how the various ranks around them were performing the ordinary occupations of life: they were chiefly for the purpose of representing, historically as it were, events and personages with which the people were familiarised by their spiritual instructors. 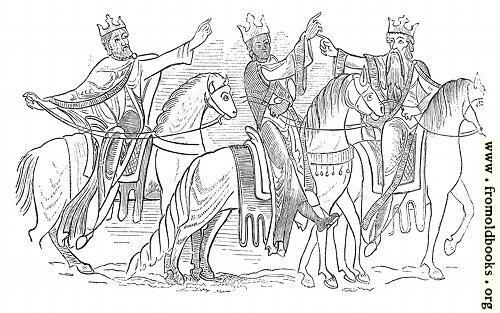 But, knowing nothing of those refinements of art which demand accuracy of costume, and caring nothing for what we call anachronisms, the limners of the Anglo-Saxon chronicles and paraphrases painted the Magi in the habits of their own kings, riding on horses with the equipment of the time (Fig. 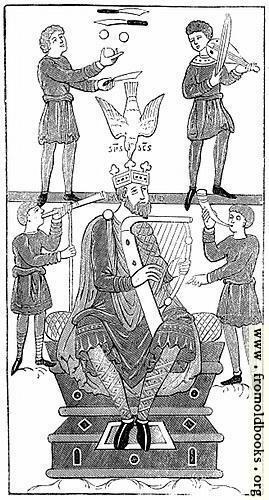 283); they put their own harp into the hands of the Royal Psalmist (Fig. 284); and they exhibited their own methods of interment when they delineated the Raising of Lazarus (Fig. 289). 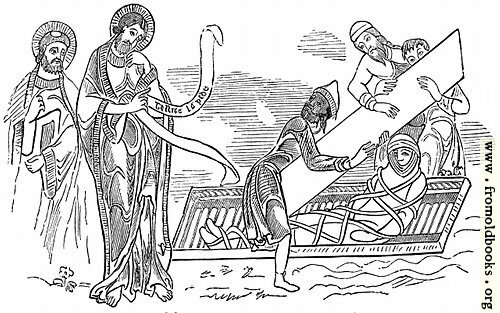 There are some, but few, Anglo-Saxon pictures of a different character. They are intruded to represent the industrious occupations, the sports, and the entertainments of their own nation. A series of such pictures is found in a Saxon Calendar, supposed by Mr. Strutt to be written at the commencement of the eleventh century, and which is preserved in the Cotton Library at the British Museum (Tiberius, B. 5). The Calendar is written partly in Latin, and partly in Saxon. The pictures represent the characteristic employments of each Month of the year. The series of engravings of the months, which occupy a part of this and of the previous sheet of our work, are principally founded, with corrections of the drawing, upon the illustrations of the old Calendar. We probably cannot adopt a more convenient mode of briefly describing the occupations of our Anglo-Saxon ancestors, than by following the order which these pictorial antiquities suggest to us.